Non-invasive prenatal testing (NIPT) has been widely used to screen for common aneuploidies since 2011. While NIPT is highly sensitive and specific, false positive results can occur. 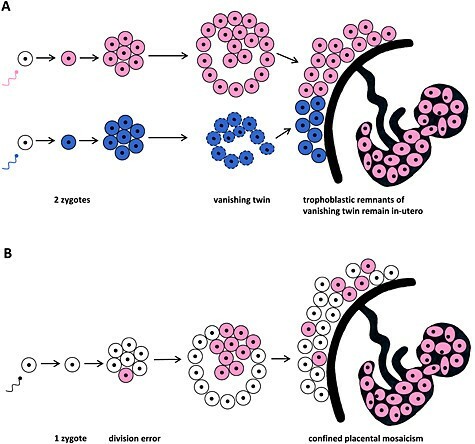 One important cause of false positive results is confined placental mosaicism (CPM). This can occur through a mitotic nondisjunction event or through aneuploidy rescue. CPM is usually associated with normal fetal outcomes, but has been associated with intrauterine growth restriction, pregnancy loss, or perinatal death in some cases. CPM may also be a marker for uniparental disomy. Given that NIPT can result in false positives, positive results should be confirmed with invasive testing before any irreversible procedure is performed. Whether to perform CVS or amniocentesis to confirm a positive NIPT result is controversial. While CVS can be performed earlier than amniocentesis, CPM can also cause false positive results.